With the latest facilities and state-of-the-art equipment, the Laboratory of Laboratory Science and Laboratory of Life Science, Pohang University of Science and Technology is equipped with the latest animal experimentation and breeding system. The experimental animal room with a total area of 979.35m2 is divided into three rooms including an SPF animal room, a culture room, and a general animal laboratory. The ancillary room includes a breeding management zone such as a small animal breeding room, a Middle East water breeding room, XenopusRoom. 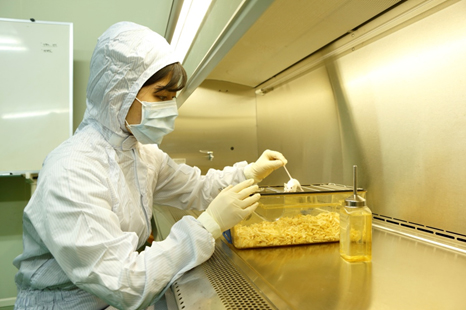 It is divided into various experimental areas such as animal laboratory, cell culture room, and behavior analysis room. It has various facilities for breeding, management and experimentation of mouse, rat, guinea pig and rabbit. The air conditioning system of the experimental animal laboratory is the air conditioning system of the experimental animal laboratory and the water supply of the animal is minimized the pollution in the animal room through UV sterilizer water purification (sterilized by UV sterilization). Management facilities: breeding observation, automatic control, purification facilities, etc. Here, there are equipment that can artificially raise embryo stem cells. Main equipment is clean bench, incubator, electroporator, electromicroscope, centrifuge, water bath. Since embryonic cells have the ability to produce normal individuals through cleavage processes, micro-manipulation of these cells into fertilized mouse embryos can create knock-out mice. This is a place where we keep the sterile cleanliness strictly and do the basic work to remove the various genes by raising the embryo cells separated from the mice. This operating room is hygienically managed CIEAN ROOM. It has facilities to perform anesthesia with basic surgical tools to perform animal surgery. Micromanipulator that can carry out embryo transfer and gene manipulation is equipped. Transgenic / Knockout Mice are produced and used for experiments.